Updates to Becky I. 's profile since your last visit are highlighted in yellow. We have 3 sons - David 46, William 44, Matthew 43 and 3 daughter in laws - Kimberly, Leslie and Cory. After high school, I worked the summer as a beautician before attending college in PA. That is where I met David (he's from Maine). I finished my first year of college, then went home and worked at the same salon, till we got married and moved back to PA.
Well, I'm not the military member but I have put in my time! My Dad was in the AF when we moved to Camp Springs, was stationed at Andrews AFB . Then David joined the Air Force in 1979 after college and we were able to live in many wonderful places over the 32 active duty. We were stationed at Vance AFB in Enid, OK, Eielson AFB in Fairbanks, AK, Griffiss AFB in Rome, NY, Keflavik Naval Air Station in Iceland, Maxwell AFB in Montgomery, AL, Bolling AFB, Washington DC, National War College at Ft. McNair in Washington DC, MacDill AFB in Tampa, FL, Pentagon,in Arlington, VA, Ramstein AFB in Ramstein, Germany, Langley AFB in Hampton, VA, then back to Maxwell AFB and back to Bolling AFB. As of April 1st, 2011 we are now retired!!! We lived, worked and enjoyed the AF life for 32 yrs! We have just moved back to Montgomery, AL to be here with the kids and grand kids. But David's retirement lasted 9 months before he took another job. He is the endorser for the NEA for about 100 Chaplains of all branches of service. So with this job he is able to work from the house and we do some traveling visiting our chaplains. He did that job for 4 yrs before totally retiring. We sold our house in town and moved into our camp on Jordan Lake. We are in the process of building our forever house. We have been blessed with 6 wonderful grand kids - Mary Alex 16, Luc 15, Ellie 14 and Sophia 2. Mary and Ellie are our son David's girls. Then Luc and Sophia are Bill's kids. And then two step grandkids from Cory and Matthew ... Christopher 24 and Cassidy 16. All our kid's live in the Montgomery, AL area. That is why we live here!!! 47+ years … After I married, we moved back to eastern PA for David to finish college. Then he accepted a church in western PA where he pastored for 2 ½ yrs. During this time he had applied for the AF and we were waiting for an opening. Once he joined the AF, we then started the life of traveling. Not only have we lived in many places but I have been able to visit many places too, all over the USA and Europe. I have worked off and on during the years as a beautician, childcare provider, seamstress and Regional Advisor with The Longaberger Company. I have enjoyed volunteering for many groups & organizations. But the best has been being a mom and now a grandma. It is true what they say about being a grand parent – they hold your heart in their little hands. Now retired and enjoying family and friends. We are now building a house on the lake as our final "Home". … typing class with John Rosser & Alan Wood - a lot of laughing and I still type with only 2 fingers BUT fast! … the many hours spent in the vocational wing, taking classes from Mrs. Wiseman. and making life time relationships with Janet Diggs, Sharon Mauney, Sharon Volm, Leslie Cook, Linda Zupancic and Ida Woodward. … shaking hands with President Johnson when he visited Crossland and came into our cosmetology class room. … seeing my Mom each day, when I went through the lunch line (she worked in the kitchen & also as the cashier). And after all these years – I wish, I had gotten to know so many of my fellow students that I admired – so I’m looking forward to seeing you again soon. Joyce (Hickcox) Ratcliffe in 1974 - Joyce is living in FL. 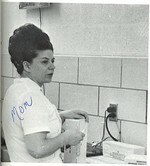 Some may not of know that my Mom worked there in the school cafeteria during my HS years. My parents moved to FL in 1990. My father passed away in 1992 - at least they had a couple of years to enjoy retirement together. Mom just moved into an Assisted Living Center in The Villages were my sister lives. She is 92 and doing good getting around. Over the last 20 yrs or so years, a group of my classmate-friends, have gotten together whenever I would come in town. I came across these pictures and will add more as I find them ... boy have we changed!!! Plus since the 40th reunion I was able to get to reconnect and get to know Cindy Wert Rohls, Betty Bush Waldron and Cathy Benner Tosh. We have become good friends these past 6 yrs taking trips together and visiting each other at their homes. Life is good with good friends. Becky I. Hickcox Cyr added a photo to her profile gallery. Becky I. Hickcox Cyr updated her profile. View. Becky I. Hickcox Cyr has a birthday today. Becky I. Hickcox Cyr added a comment on her Profile. Becky I. Hickcox Cyr posted a message. Becky I. Hickcox Cyr added a comment on James (Jimmy) M. Skinner's Profile. Becky I. Hickcox Cyr added a comment on her Profile. New comment added. Becky I. Hickcox Cyr has a birthday today. New comment added. Becky I. Hickcox Cyr added a comment on David (Dave) L. Durgee's Profile. Becky I. Hickcox Cyr posted a message. New comment added. This is our Sophia and she is soon to be 9 months She has a new puppy to grow up with her. His name is Bo. Our beautiful girls ... heading out to dinner and a Newsboys concert. Luc and his sister Sophia. Becky I. Hickcox Cyr posted a message on Thomas (Tom) W. Washington's Profile. Hope this note finds you well and enjoying the start of spring! I and two other classmates (Cindy Wert Rohz and Betty Bush Waldron) have been going to Naples, FL for a week of beach, plays, shopping, etc for the about 5 years. We are heading to FL next Monday 18th and so looking forward to the vacation. When we were there 2 years ago, we contacted the classmates in FL. Happily we ended up with about 8 of us and we had a great time together. So we would like to do the same and get as many classmates together for dinner. The days we are available are Thursday 21th or Friday22nd late afternoon or evening. Please let me know if you can come and how many so we can make reservations. Also if you know of any classmates around the area – please let them know also so they can come too. I am tiring to email everyone I know who is living in FL (from the CHS site). 40 th Reunion - School Tour ... Another picture of our cosmetology group - Sharon Volm, Ida Woodward, Linda Zupancic, Me and Leslie Cook - 40 years together! Since the 40th reunion Cindy, Betty and I have conected and have had some fun times together. Here we are in Naples, FL after a shopping trip ... yes we did leave some items in the store. *My beach and shopping buddies ... Cindy Wert Rohls, Betty Bush Waldron and me. Betty Bush Waldron and Cindy Wert Rohls came down to visit me for a week in Montgomery, AL. This was taken at the Rosa Parks museum (with the 69 Crossland bag). I traveled to DC for a business trip and spent a day with Cindy Wert Rohls and Betty Bush Waldron. This was taken at Lincoln's Cottage.